408 pages | 27 B/W Illus. 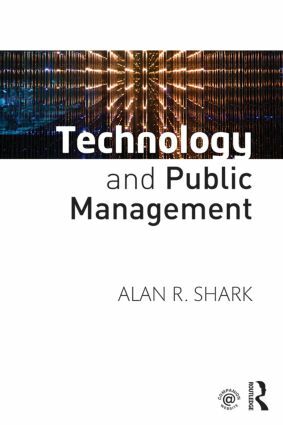 At last, here is a textbook that covers the field of technology and public management in an informative and engaging style. Ever since the National Association of Schools of Public Affairs and Administration required greater infusion of technology into the curriculum, faculty and administrators have struggled with finding the right course materials designed specifically for the public administration environment. Technology is no longer the sole domain of an information technology office, as it has evolved into a growing set of complex tools that influence every area of government. To be effective, every public manager needs to be actively engaged in technology decisions. This textbook is designed for students of public administration at every level who need to know and understand how technology can be applied in today’s public management workplace. The book explores the latest trends in public management, policy, and technology and focuses on best practices on governance issues. Finally, this book provides real-life examples about the need for policies and procedures to safeguard our technology infrastructure while providing greater openness, participation, and transparency. The latest technology trends and their potential impact on public administration. Alan R. Shark is the executive director/CEO of Public Technology Institute. He also serves as Associate Professor of Practice in the School of Public Affairs and Administration at Rutgers University - Newark, USA. As an author, lecturer, and speaker on technology developments and applications for most of his distinguished career, Dr. Shark's experience both balances and embraces the business, government, education, and technology sectors. He is a Fellow of the National Academy of Public Administration (NAPA), where he is the chair of the Academy’s Standing Panel on Technology Leadership. He is also a Fellow of the Radio Club of America (RCA), and Fellow of the American Society for Association Executives (ASAE). He is the recipient of the prestigious National Technology Champion Award from the National Association of State Chief Information Officers. The award is in recognition for his outstanding contributions promoting government performance excellence through sound information technology solutions, policies and practice. Dr. Shark holds a doctorate in Public Administration from the University of Southern California, USA.